Here is an unusual photo for today... I took it near le Louvre, a couple of days ago, while these two gendarmes (gendarmes are actually police who belong to the army, if I'm not mistaken) were going back to their barracks. 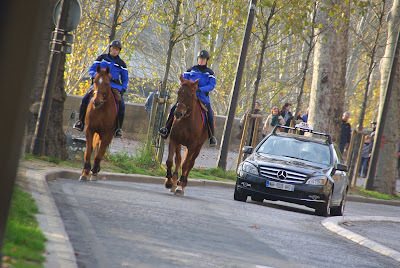 I thought it's funny to see that even nowadays taxis have to share their lane with horses! Have a nice Friday everyone! Colorful jackets! Leave it to the French to be have the best well-dressed gendarmes. What are those black bands on the horses ankles for? I never saw that before. What is it? I would never have guessed that this is in the middle of Paris. Now THAT would be a great job. Riding a horse around Paris all day, making sure that your presence is seen in a stylin' color like that, okay, the helmet, not so much fun. But all in all, a great job! Wonderful to see horses in Paris! They look quite happy! Lois the black bands on the horses "ankles" are protective wraps or some call them boots. Horses have delicate tendons in their legs and particularly their fetlock joints. They are simply to help provide support and to help prevent injury :-). I'm with Christie—great job (even if you do have to share the road with taxis and wear an unflattering helmet)! Bon weekend, Eric. What magnificent beasts! The horses. I meant the horses. Do you have any photos or journals that focus on the un-ending obsession of Parisian women and their scarves ?? Scarves are a never-ending statement of the beauty (and competitiveness) of Parisian women yet I have seen noting here !! @Winski "Do you have any photos or journals that focus on the un-ending obsession of Parisian women and their scarves ?? " Actually I don't but I agree with you, scarves are a big fashion element for Parisiennes. Eric, "scarves are a big fashion element for Parisiennes". I am not Parisienne, but I am French-American -- and yes, I wear scarves (especially at my age). Scarves make a woman's neck look beautiful and graceful. My father once made a comment on how American women spend so much time on their faces and completely neglect their necks. He said, when looking at a women, going from the face to the neck was startling. Horses. Women. Filles. This is too dangerous so I think I'll leave the rest to the grammarians and linguists and stay out of it. I don't want to be trampled or put my hoof in mouth. the style looks pretty unique. @Lois. "and yes, I wear scarves (especially at my age)" LOL on the "especially at my age"! even though I'm sure you don't need to conceal your neck under a scarf Lois! In my opinion it's just a "fashion accessories", just like any other. Of course, it helps if you live in a country where you do have a winter! Again these pics are just superb. Great Shot! i wish he was in Paris..
@Winski " I am in NO WAY implying this is a bad thing, it's just great fun to watch if you're aware it's happening...."
I'll be honest... I'm not sure I am!